This post is made up of two separate posts that I have shown in the past, so if some bits are repeated, just put it down to my inexperience of making up posts. Because I have trouble using a four jaw independent chuck, I am now going to introduce you machinists to one of the most underrated bits of kit you can buy. Some of you will have heard of one, some might have even seen one, but most have no idea how versatile this lump of metal can be. 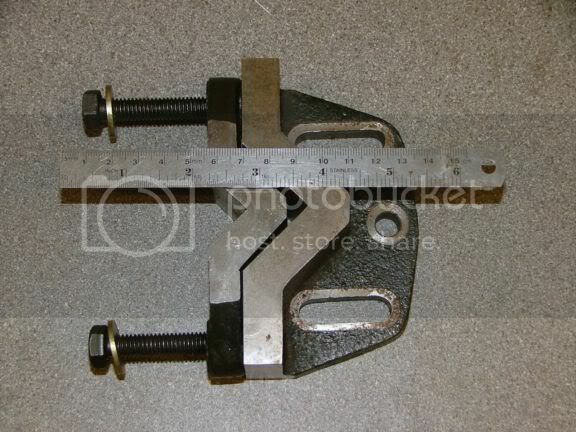 Another version, from the US, is called a Rike vice, but it is not quite as versatile, unless you modify it a lot. Before I go on, just picture the scenario, making a few model engines, all with the same cylinder with an offset bore. What a PITA setting up the four jaw every time just to bore the thru holes. Say you have got a long throw crank to make, and your four jaw can't give you enough offset, what do you do? I will now show you the infamous bit of kit. I will just explain a little about the two castings. 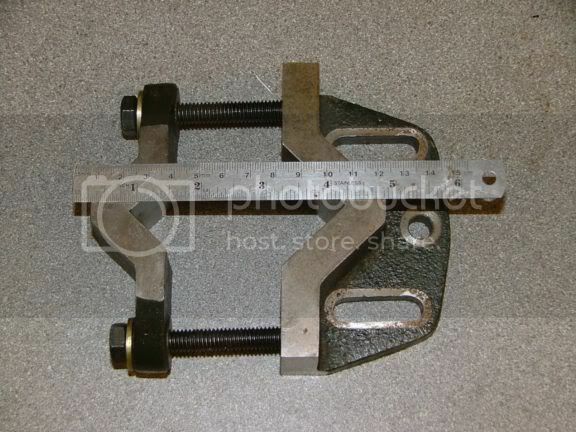 The big one wiv the big 'oles is ground with the baseplate and v-groove at perfect right angles. 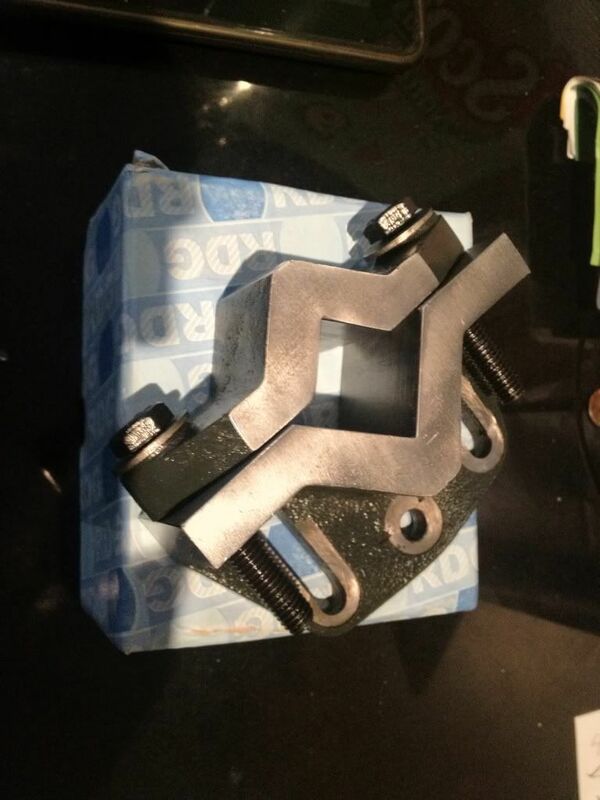 The smaller gripper casting is also ground up square, but is slightly narrower top to bottom than the main casting, this ensures that the main casting is used as the datum faces and the gripper plays no other role than clamping the part. 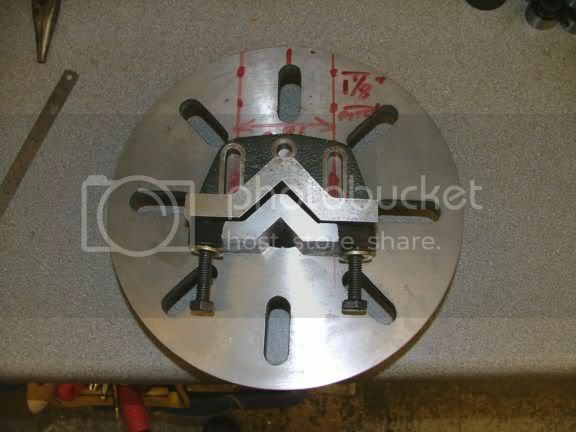 This first pic shows the plate set up for holding large bits, if you used longer bolts, it could hold up to 3.5" diameter. Here it is with the grip plate turned around for holding small stuff. 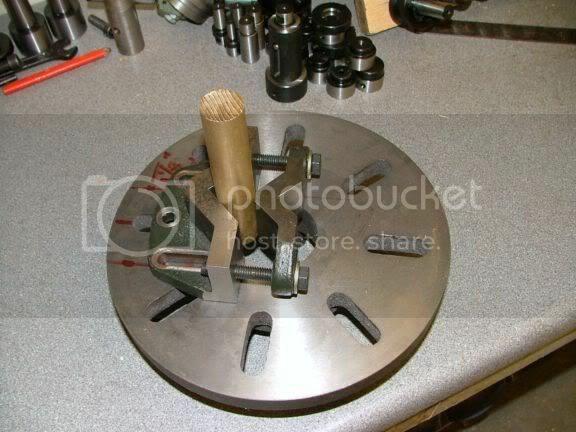 Now for all you lathe owners, this bit on your shelf or in the cupboard, covered with 1/2" of crap piled up on it is actually called a faceplate, and yes, it does fit onto your spindle nose, and yes again, it does have a use other than gathering dust. 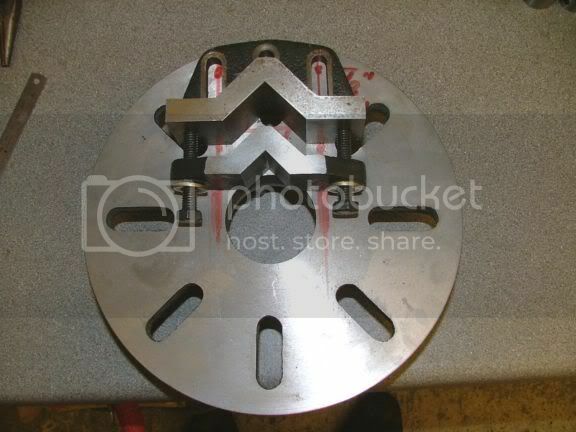 This one is mine, and if you look at the red markings on it, it is about to be drilled, then the Keats angle plate will be bolted to it, and it will transform your four jaw PITA work into something a little more civilised and less painful. If your faceplate is smaller, you might even find that the holes line up with the originals. As you can see, I haven't drilled it yet (and won't do for a few more days yet, but I have put the plate on to show the normal operating range of your 4 jaw. So how is it better than the 4 jaw? 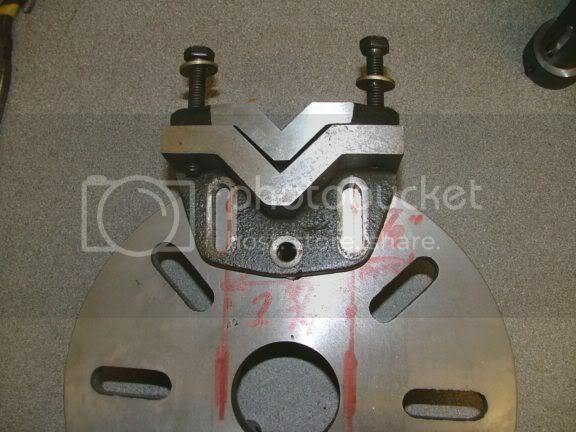 Once you have set up the initial job in the V's, and gently tapped the plate into the correct position, then done a white knuckle job on the holding bolts, you can just slacken the gripper and drop another piece in, tighten up and machine it exactly the same as the first. If you used a 4 jaw, once you slacken one of the jaws, you are forced to set the next piece up, just like the first one you did. I am sure I know which one I prefer to use. Here it is shown with a lot more offset if needed. And if you are really brave (or stupid) and have enough clearance for a big swing, rather large offsets can be obtained. I must add now, with any faceplate work, using a large offset you should really balance things out by clamping a weight, roughly the weight of the keats plate and workpiece directly opposite on the faceplate, just to balance things out. Otherwise things start to get out of hand very quickly. Here is a shot of it holding a bit of 1" brass. But there is even more talent this lump of ground up cast iron can show you, look at the next pic. It doubles up as a very versatile clamp for holding things truly vertical on the mill. I am not saying this item is the be all and end all to your offset machining, but it sure goes a long way, at about 30 squid incl P&P in the UK it has to be a good investment. Just tinkering about the shop, I decided to finish off a little job I should have done ages ago. Nothing too strenuous or mind numbing, just a few 8mm holes drilled and tapped in a logical pattern into my faceplate. By doing this, it allowed me to bolt on my Keats angle plate. I have mentioned these before, and IMHO they are a lot easier to set up than a four jaw. Maybe not as versatile as a 4 jaw independent with regards to size holding, but if you are making more than one of the same thing, it can save you hours of setting up. 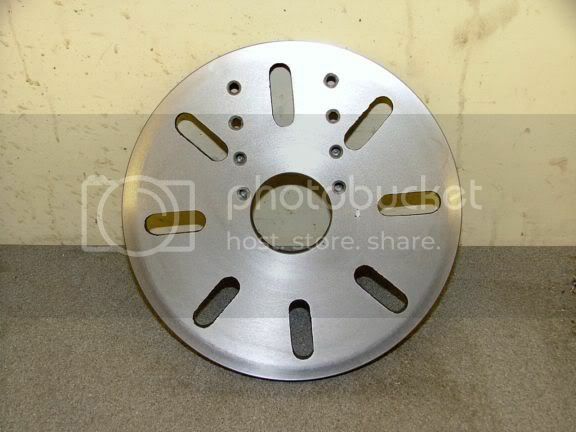 Once you have tapped the plate into it's final resting place for doing the job, and tweaked it up tight onto the faceplate, if you need to do another of the same thing, just slacken the two clamp screws, put in a new piece part, and away you go. With a four jaw, your have to reset the jaws every time you slacken the jaws off. Holding a bit of square bar. Then a bit of small round. My four jaw is massive and too heavy for me to lift safely, and until I get my new donated chuck mounted up, this will do me just fine. If you can fit one of these onto your faceplate, for the price, it is silly not to have one. I didn't mention this time that they can be bolted or clamped to your mill table to hold things perfectly vertical for milling, or can also be used on a surface grinder or shaper for doing the same thing. Or even on your surface plate for marking up. Can't think of anything else just yet, but I am sure there are a lot more uses. It is a real universal tool. Thanks for the write up John, I need to get one myself. That will save me some setups time for sure. OK John....pulled the trigger this morning......It'll be here eventually. I don't think you will regret it at all. I don't know how much the carriage is to the US, but here in the UK, that price includes the carriage, so at that price, it is not worth trying to make such a versatile bit of tooling yourself. Maybe the US lads could follow the Rike vice route if the cost is too high. Does the same sort of thing, but not as versatile. 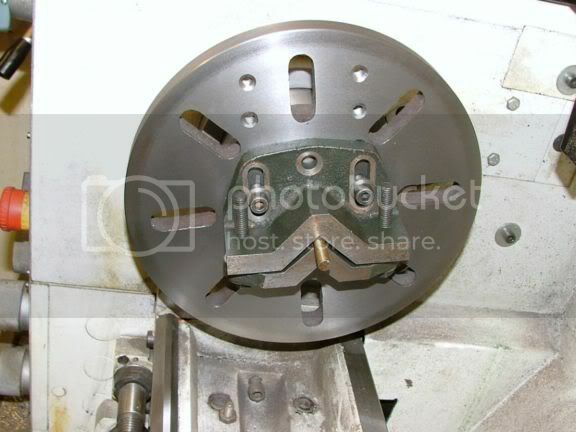 True Bogs....but I've got enough tooling to make for the SB as it is.....sometimes I just want to buy it. John I have built the Rike vise. It is useful for certain applications, but cumbersome. There is a lot of metal removable to make this vise. 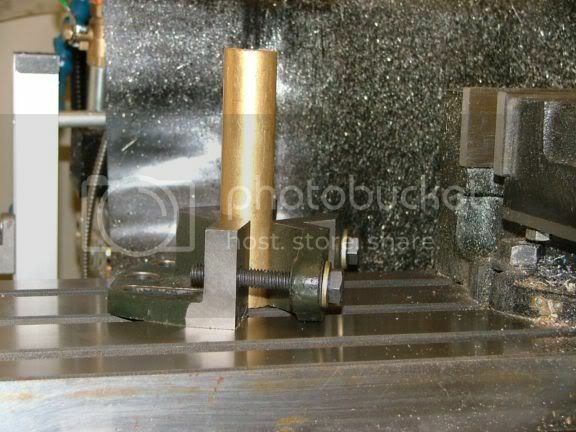 I used the Rike vice to bore the cylinder of my Epicyclic engine. But I really want to give the Keats plate a try. This will be very useful. I was going to make it but I'd rather build engines. If someone has a copy of magazine #3 of Model Engineers Workshop (winter 1990) then there is a very good build shown of it, and if someone can cast cast iron, then it could easily be made from that article, as all critical dimensions are shown. The other option is to fabricate one - it was Len Mason (I think) who gave a good description of doing this in one of his books. I have a little micro version here that I made to go on the 3" faceplate I made. It was, in "Using The Small Lathe", published in 1963. The gadget in the original post is not a Keats. This is a Keats. This appeared in the mail today. 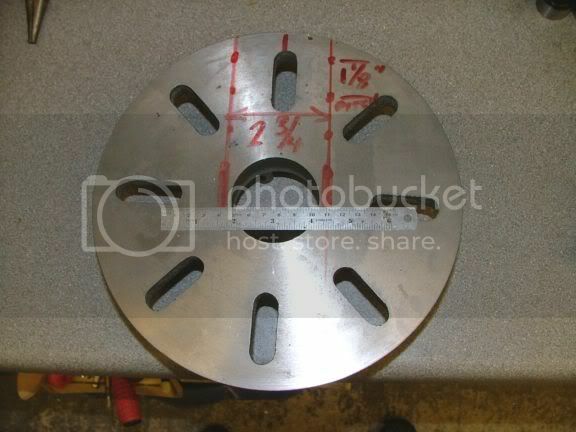 Drilling of faceplate will commence as soon as I finish the Epicyclic Engine flywheel. Stan you guy made me break down and order one, and by the way how is the Epicyclic engine coming alone. Are you doing a built log? The Keats looks better "in person" than in pictures. Nicely machined. This will be VERY helpful. Big thanks to John! As for the engine, just finished the flywheel a few minutes ago. That was the last piece ,so, assembly, disassembly, sanding , filing, polishing, re- assembly, etc. Build log will follow. 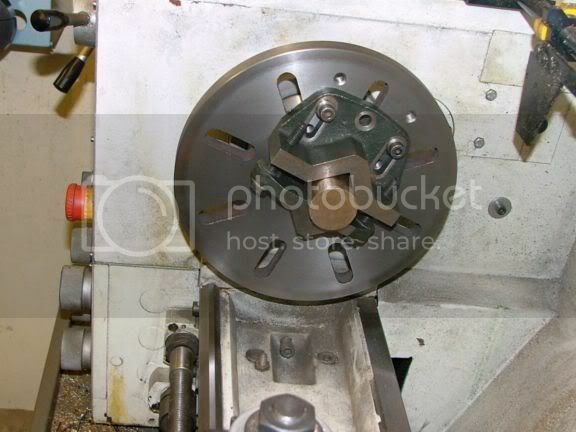 I have pix of machining every part. I like post my build logs when I have a runner. Looking forward to it Stan! Thanks Stan, looking forward also. I want to warn you before you secure the ring gear. Before lining up the rotating gear with the ring gear teeth. Match the teeth in the full up position of the stroke of the piston and square off on the piston rod for a square upper stroke. Then center punch the two matching gears. I had fail to do that on mine and I had drilled the holes, so I ended up getting a new gear and doing it all over. Be sure to use the jig for set up. If you fail to do this the stroke will go up sideways and will bind, just from a minimum of offset. The gear is drilled and attached. I made the jig to do it last week. 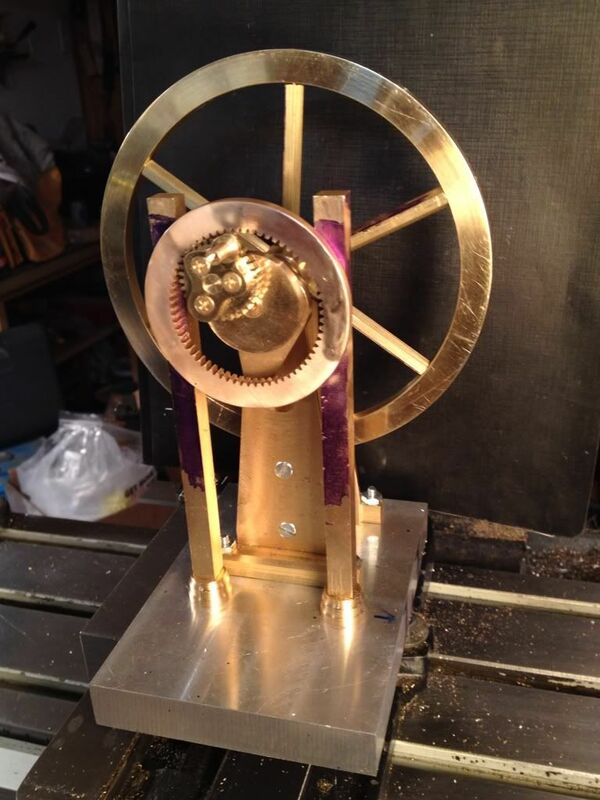 Placed the piston/steam box and spinning the flywheel, everything is very smooth. No binding (that's a first). At $80 for the gear, I was VERY careful before drilling. I have never had any trouble getting deliveries from RDG, always very fast, but I am really surprised how fast they got that one to you, it must have caught all the connections just right. I think you will really find the benefit of the Keats when you come to do more than one item the same. 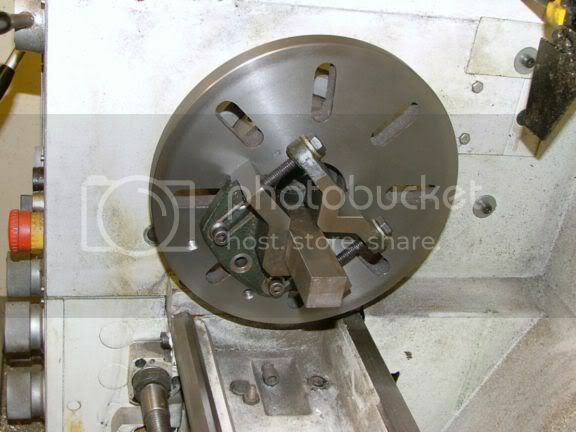 When making my small production engines, 12 cylinders at a time, which were square with an offset hole, I could just prepare all the cylinder blanks, set up the offset, and then drill them all, then bore, then ream, just three tooling changes, rather than having to do each one individually as you would in a four jaw, drill-bore-ream, changing the tooling a dozen times, so 36 tool changes in all. You couldn't do that with round material with an offset hole, but at least you wouldn't be needing to set the four jaw up at each component change. Even down here in the wilds of Oz, they get stuff through pretty quick. Yea Dave, I ordered mind on the 4th and it showed up on the 8th across the pond. That is pretty dam good time. Today I received my indexer which I had ordered on the 3rd and it came from the state. I'm really glad you lads like the little tool. I am sure you will start to appreciate it for what it can do when you start to use it. When I first got mine, I only used it on the faceplate, but now it gets used all over the place, on almost all pieces of machinery. It is now just part of my interchangeable tooling system that I have been striving for for many years. Bad Behavior has blocked 16086 access attempts in the last 7 days.